While I had planned for months to take South Norwalk on the trip, Mother Nature, apparently unamused by my dig at her in my recent 'surviving in winter' post, saw fit to target Washington with a winter storm so bad they gave it a name. 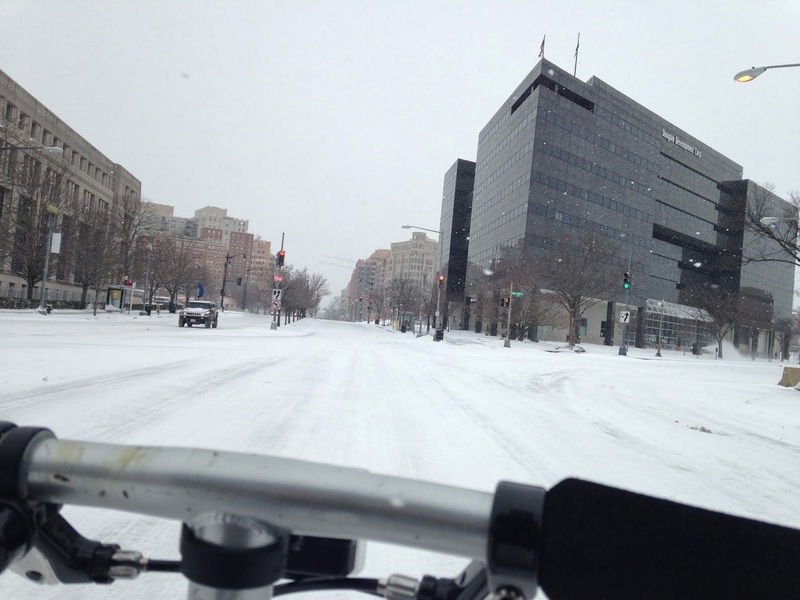 I decided to take South Norwalk anyway and rode it from Union Station to the Renaissance Hotel - the location of the 2014 National Bike Summit - over about an inch of flattened snow while even more was coming down. As it turns out, South Norwalk, with its 14" tires, has the soul of a polar bear. It looked like this all the way up Massachusetts Avenue on Monday morning. I had snowbike-like traction and made good time. I didn't fall, but if I had I probably would have been okay since the closing of federal offices the day before meant there weren't many cars on the roads that could hit me anyway. Only having the ability to stay in D.C. for a day and a half, I tried to get as much out of the conference as possible. And they do pack a lot in. 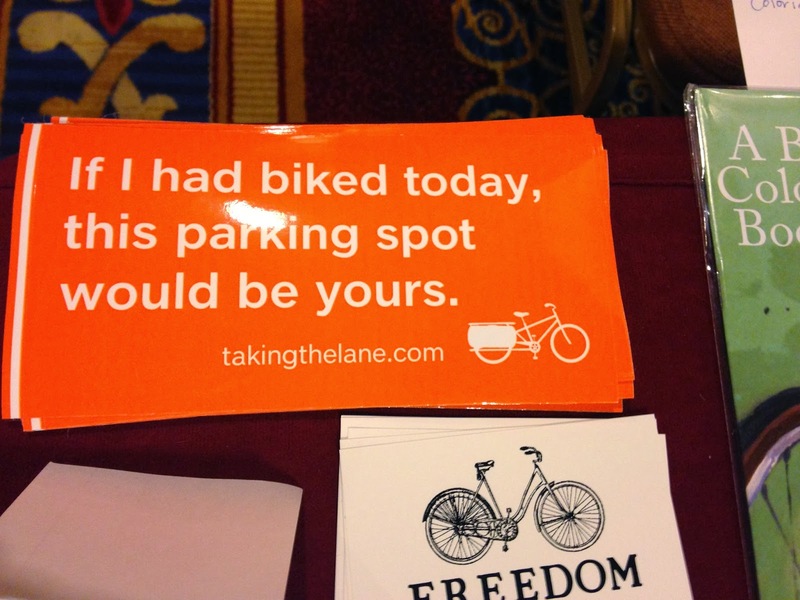 Even though I didn't attend the 2014 Women's Bicycling Forum I did get to mingle with the crowd at the exhibitor's area. My travel budget allowed for the purpose of a $1 bumper sticker from Taking the Lane that spells out what I've been saying for ages. I wasn't, however, crazy about the free Timbuktu messenger bags they were hanging out. For bags with a hook-and-look fastener they look nice, but because I was packing insanely light (and had to carry a change of clothes, a toothbrush and other things around with me each day) I elected to take the materia inside - including a copy of Bicycle Times and Momentum magazine - and give back the bag and the water bottle at the front desk. I attended the first timer's meeting that day, where I met several others from my home state - most from Bike/Walk Connecticut - so we could listen to The League president Andy Clarke give us some pointers for talking to Congress and their staffers - which a lot of attendees are doing today on Capitol Hill (and if you are not attending, you can contact your congressman by using the great tool on house.gov). The free bag did have - which I also kept - a handy little booklet showing details of each state's leadership. Connecticut, being a small state, can be viewed in one spread that unfortunately shares a page with Delaware. 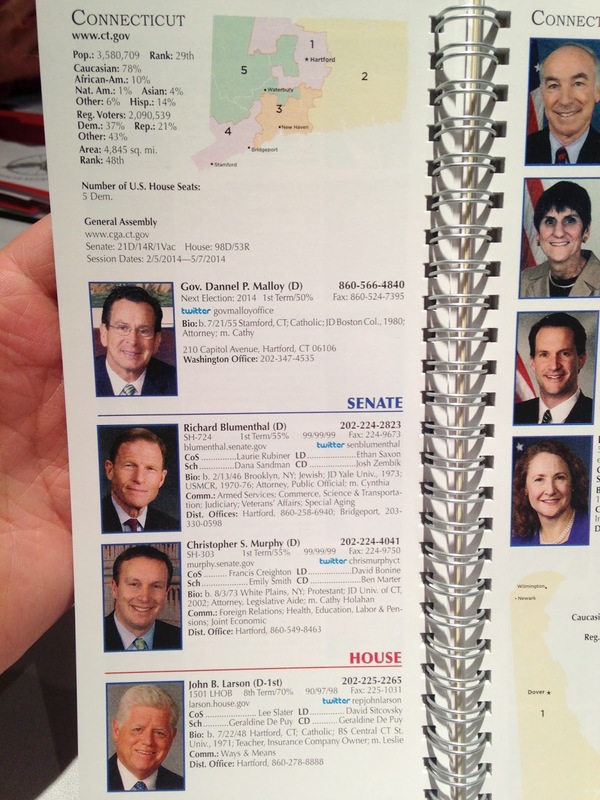 Here's Connecticut's leadership: Governor Dan Malloy, Senators Richard Blumenthal and Chris Murphy, and Representatives John Larson, Joe Courtney, Rosa DeLauro, Jim Himes and Elizabeth Esty. I've met two-thirds of this group. I even had breakfast with the Congressman from my district (the 'fightin' forth!' as Stephen Colbert might call it), Jim Himes a couple of years ago. Now this conference absolutely has a fun factor. 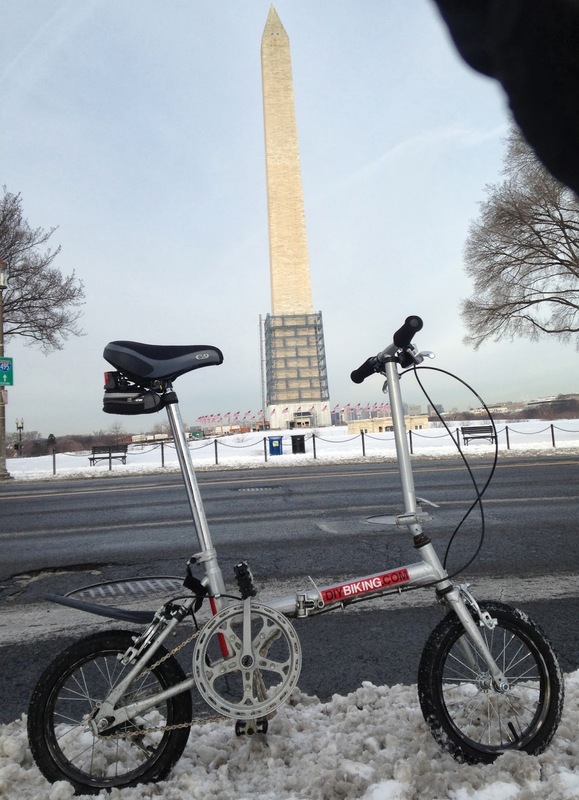 I learned about cool electric bikes like Biike and Pedego, about TIGER grants, about Dero bike racks, and at lunch yesterday we heard from the new U.S. DOT Commissioner Anthony Foxx (which was really cool, by the way). I also got to put faces to people I follow on Twitter like Lillian Karabaic and even got to see the director of Bike Cleveland, who I met a couple of Cleveland trips ago. He told me they moved offices, added a staffer, and there would be even more bike infrastructure in Cleveland if I visit this fall. 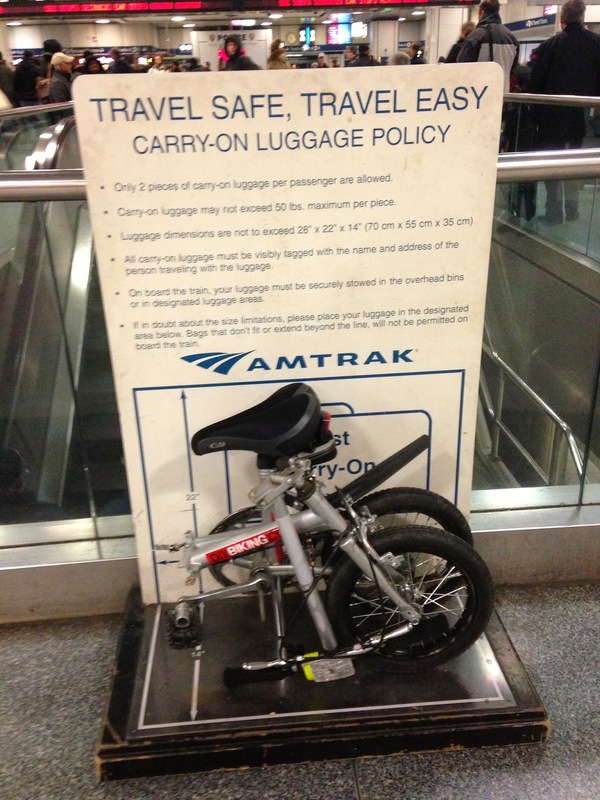 Bicycle and Pedestrian Safety Act (HR 3494); Senate version is called S 1708. Safe Streets Act (HR 2468); a similar bill in the Senate is S 2004. Thanks to public record (and useful fact sheets handed out to each state represented at the Summit) I quickly discovered none of Connecticut's representatives are co-sponsors on any of those three House bills, and the meetings The League scheduled today for Connecticut and nearly every other state are meant to hopefully change all that - or at least get the reps/staffers to think about cycling differently. Each state delegation has their instructions as they go to the Capitol today to talk about cycling. Some of the rules include 'Don't Wear Lycra' (I'm sure The League wouldn't have added it unless someone had actually done that), be professional, follow up, and come up with a way to invite a rep to your district to meet on the issue in such a way (preferably one that invites a good photo-op or chance to talk with other constituents) they want to go. (Yes: anyone attending the 2014 National Bike Summit can feel free to borrow a page from my Cycling with Candidates project I did with the Democrat and Republican mayoral candidates last summer. There's a lot in these bills for both parties to like so don't let a little 'D' or 'R' next to the name of your representative throw you…no matter what letter follows your own name). 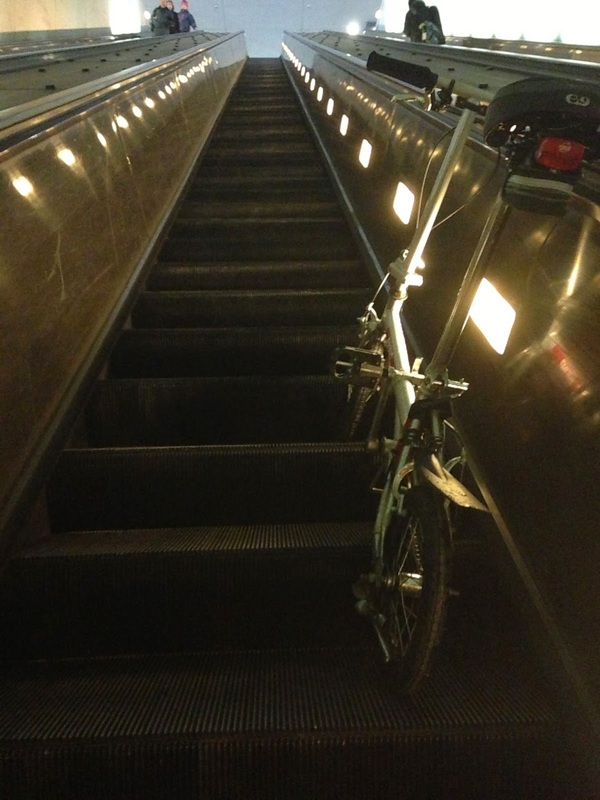 Now if you are a cyclist and you are not attending the 2014 National Bike Summit, I recommend you visit House.gov and Senate.gov and send a friendly e-mail to your representatives expressing your support for these bills. But like The League said: it can't stop there. A recurring theme in a lot of the break-out sessions I attended yesterday is that a cyclist needs time, patience and grit to get things done. A Tweet won't do it - you have to follow up with everything that you do when you reach out to a representative. Since I'm back home in Connecticut today suffering from a late-Amtrak train hangover (more funding for Amtrak is another conversation) I shall do that and also extend an invitation to my congressman, Jim Himes - who is doing the first leg of the Sandy Hook to Washington Ride, by the way - to meet me in Lorca to talk over churros or the quiche-of-the-day about why cyclists and walkers need to be safe (there are going to be a lot more of them whether any of these bills become law or not) and take a little bike ride in Stamford. Just as I did with the mayoral candidates, congressman, I'll provide the bike if he likes. I do wish everyone in D.C. luck today as the meetings begin. You will do fine as long as you stay professional and recognize it could take years to change a person overnight. And no matter what state you live in, if you're not in D.C. please reach out to your own representative and tell them how you feel about these bills, and seriously consider attending the 2015 National Bike Summit, which will hopefully bring better weather. Thanks for reading and thanks for riding.